I’m not sure whether that’s a slam or a compliment, but I do love planting a good red herring in my mysteries. One of the best red herrings of all time was The Red-Headed League. In this fun Sherlock Holmes story, the “league” is a falsehood to cover a bank robbery. 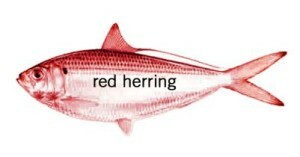 What makes some red herrings good, and others stink like yesterday’s…well, red herring? Red herrings shouldn’t scream, “Hey, I’m a clue!” from the rooftops. Readers are smart, and they’ll be working to solve the mystery as they go. They don’t need you to stomp on ’em. The subtlety rule applies to all clues, not just to red herrings. You can plant a red herring before your victim turns up dead, right at the beginning of your story. At that point, your reader doesn’t even know who is going to get killed, much less whodunnit. All clues, including red herrings, must serve to move your story forward. Don’t use your red herrings only as a way to throw the reader off. Make them integral to your plot or character-building. In some of my books, I wasn’t sure who the villain was until very near the end of the writing process. I write all the clues so that any of them can be red herrings or valid clues, depending on the ending. Are there any other rules that you follow when writing red herrings? What are some of your favorite red herrings in crime fiction?